At age four, Vicky Ntetema would sneak out of her house in Tanzania to go to school. She was still too young to enroll. Her mother had to lock the doors to keep her inside. Decades later, Ntetema’s doors are still locked. Her house is surrounded by barbed wire and is guarded 24 hours a day. Ntetema, 52, a freelance journalist who contributes to the BBC, writes about a subject so dangerous she fears for her life: the murders of albinos in order to harvest their arms, legs, hair and blood. Witch doctors in Tanzania have marketed the notion that potions mixed with albino body parts and blood will good fortune. Some body parts can fetch up to $2,000 US. 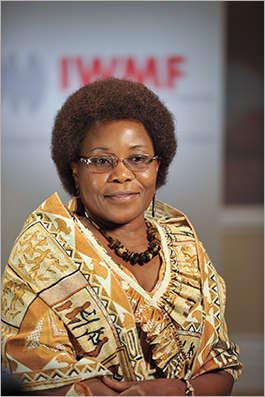 For her fearless reporting and dedication, Ntetema is the recipient of a 2010 Courage in Journalism Award from the International Women’s Media Foundation. In November 2007, Ntetema, became curious about a string of albino murders and the involvement of witchdoctors, who hold powerful positions in traditional African society. More than 90 percent of Tanzanians believe in witchcraft, according to a survey by the Pew Forum on Religion and Public Life. And more than 50 documented killings of albinos have occurred since 2007, said Ntetema. Witchdoctors often use hired killers and are protected by local police. Ntetema’s confusion as to why her fellow Tanzanians would kill others led her to investigate. Frustrated by the lack of information she received from police, she decided to speak to witchdoctors herself. “Just pray for me,” Ntetema told her. Ntetema visited regions of Tanzania where witchcraft is especially prevalent, notably near Lake Victoria. Posing as a businesswoman interested in becoming wealthy, she gradually gained the trust of several witchdoctors. She confirmed what she suspected: they offered parts of albinos – including hands, bones, hair and blood – to use in potions to make her successful. “I cannot believe Tanzanians would kill in order to succeed,” Ntetema said. Ntetema uncovered gruesome details from the witchdoctors. For instance, minerals in mines are believed to be held by spirits; one must feed the blood of albinos to the spirits to set the minerals free. Bones from albinos’ legs are said to act as metal detectors, and the severed hands of albinos used to pull up fishing nets will bring a good day’s catch. Though she worked carefully to conceal her identity as a reporter, Ntetema had two close calls: once, her tape recorder slipped from where it was hidden in her clothing; another time, her recorder fell out of her purse. But on July 11, 2008, Ntetema wasn’t so lucky. She was leaving a meeting with a witchdoctor when she ran into a police officer she had spoken with as part of her investigation. He, too, was waiting to consult with the witchdoctor. Soon after, Ntetema received a text message telling her to watch her back and that she and her family were being watched. On July 21, the night the BBC segment on Ntetema’s investigation aired, she received a call from the police in Mwanza, one of the regions she had visited. “You have put your country in danger,” they told her, threatening to sue her. It was then that the BBC told Ntetema to get out; she traveled to London for her safety and later went to Kenya as well to escape increasing threats on her life. Staying away from her country was difficult for Ntetema. After winning a government scholarship and completing her bachelor’s degree in the former Soviet Union in 1985, she returned to Tanzania only to find she was overqualified for many government and journalism jobs. So when she saw an advertisement for Swahili teachers in the United Kingdom, she headed to London. Ntetema joined the BBC in 1991 as a Swahili translator but didn’t lose sight of her goal to return to Africa. In 1992, when private media began to gain popularity in Tanzania, she applied for some jobs but was still deemed overqualified. She asked her editor at the BBC to let her gather more of the news in addition to reading and translating it. When the BBC decided to expand its Tanzania office, Ntetema was a logical choice. So, in 2005, 20 years after graduating college, she returned to work in her home country. She conducted journalism training programs and served as bureau chief but continued to report. “I wanted to go to the villages and see how people were living there and what their issues were,” she said. Learning about the issue of albino killings so compelled Ntetema that she decided to slightly change her career path – in April 2010, she left the BBC. Although she still contributes as a freelancer, she realized that the day-to-day demands of news coverage didn’t allow her the time she felt she needed to investigate albino murders. “For me, I cannot keep quiet if something has happened,” she said. Ntetema is also executive director of media and international affairs for Under the Same Sun, a nonprofit organization that supports albinos and others who are disadvantaged or marginalized. In part due to Ntetema’s coverage, eight people have been convicted of killing albinos and are sentenced to death. One of these is a boy who killed his own mother, she said. Other cases are being tried in court, and Ntetema often attends proceedings dressed in a burka so that people don’t recognize her and threaten her or ask her to leave. Although some progress has been made, Ntetema acknowledges that there is still a long road ahead to successfully change people’s beliefs about albinos and halt the killings. “It’s a very tough task,” she said. Vicky Ntetema is the first Courage in Journalism Award winner from Tanzania.